Gambling is fairly common in the United Kingdom, in fact, sports betting, online remote gambling, gaming machines, card games, and lotteries are common forms of gambling available to adults 18 and over in Great Britain as part of their minimum gambling age. Licensed and regulated UK 18 and up online casinos that operate offshore are also permitted as long as they are whitelisted by the UK Gambling Commission. The actual options that are available to everyone are dependent on the age of the player. We will explain further what exactly the country refers to as a minimum legal gambling age rating, as 16-year-olds can enjoy limited forms of betting as well. 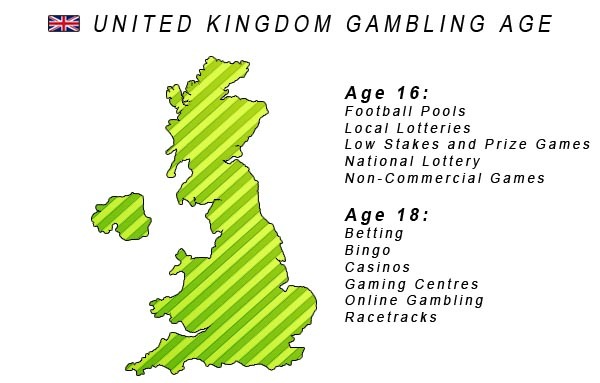 The following licensed offshore casinos accept UK players who are 18 and over and are legally sanctioned to provide online gambling services to British players. These sites have been approved by the UK Gambling Commission. When Did Great Britain Legalize Gambling? Lotteries can be argued to be the first form of legalized gaming in the region from a statute dating back as early as 1698 which was limited until it was further expanded in 1934, 1956, and finally in 1976. Casinos began as part of members-only clubs which were licensed and regulated by the Gaming Board of Great Britain. Britain’s first alleged casino, the Casino Club Port Talbot in Wales was opened in 1961 by George Alfred James. This man opened several establishments which combined gaming and fine dining in the 1960s including the Golden Horseshoe in London, the Charlie Chester Casino, and the Kingsway and Grand Casino in Southport. In 1968, the Gaming Act freed British law to allow for the establishment of commercial casinos. Later on, in 1993, the National Lottery Act amended the law to allow lotteries to be used to raise capital for beneficial causes for society. Currently the National Lottery is managed by the UK Gambling Commission (UKGC) and for the most part, lotteries must be licensed by the commission except for smaller lotteries but these still need local authorization. In 2005, the Gambling Act allowed for resort-style casinos to become established but with limitations on their creation to one every few years. Hundreds of cities bid to gain these Las Vegas-styled casinos such as Manchester. However, the city later reviewed their plan and opted for 16 smaller casinos. In 2014, the greatest regulatory change occurred where the UK opted to only allow online gaming platforms licensed by the UKGC, the European Union, Alderney, Isle of Man, Barbuda, Antigua, or Gibraltar. What Is The Legal Minimum Gambling Age In The United Kingdom? Generally, the minimum age rating in the U.K. is 18 which allows young adults to enjoy casinos, racetracks, online gaming such as 18+ online casinos, gaming centres, betting shops, and bingo halls. However, patrons as young as 16 can play the National Lottery, local lotteries, non-commercial games, low stakes, and prizes, and enter football pools. Even more peculiar is the lack of minimum age requirements to play teddy grabbers, coin pushers, amusement arcades, and low stakes fruit machines, allowing anyone to use them regardless of age. Nonetheless, the British are serious about their age restrictions. Those who are found participating in an event, contest, or game while underage will be charged with a criminal offense. What Forms of Gambling Are Legal and Available In The UK? As discussed earlier in this guide, legal forms of gaming in the UK include Arcades, Sports Betting, Bingo, Casinos, Lotteries which include scratch cards, local lotteries, the national lottery, and Gaming Machines. All forms mentioned above allow 18-year-old players to participate in their events. Age ratings are based upon the available game and set by the Gambling Commission. Generally, the minimum age rating in the U.K. is 18 which allows young adults to enjoy casinos, racetracks, online gaming, gaming centers, betting shops, and bingo halls. However, patrons as young as 16 can play the National Lottery, local lotteries, non-commercial games, low stakes, and prizes, and enter football pools. Even more peculiar are the lack of minimum age requirements to play teddy grabbers, coin pushers, amusement arcades, and low stakes fruit machines allowing anyone to use them. Nonetheless, the UK is strict upon its age restrictions. Those who are found participating in an event, contest, or game while not of the appropriate minimum age will be charged with a criminal offense. The most popular 18+ casinos to visit in the U.K. depend on the city patrons would like to visit, the types of games they would like to engage, and the environment they’d like to be in. In London, popular casino options include 50 St. James, Ritz Club, Grosvenor Victoria Casino, Genting Casino Cromwell Mint, Clermont Club, Grosvenor Casino Russel Square, and the Aspers Casino Westfield Stratford City. In Nottingham, there is the Alea Nottingham Casino, Dusk Till Dawn Poker and Casino, Gala Bingo Clubs London, Genting Casino Nottingham, and the Grosvenor Casino Nottingham. In Glasgow, Scotland casino options include Alea Casino Glasgow, Genting Casino Glasgow, Grosvenor Casino Merchant City Glasgow, and Grosvenor Casino Riverboat Glasgow. In Cardiff, Wales casino options include the Grosvenor G Casino Cardiff, Les Croupiers Casino Cardiff, and the Rainbow Casino Cardiff. Hundreds of more casinos populate the United Kingdom, but the list is too vast to include in this section. What Is The Minimum Casino Age Limit In The United Kingdom? The minimum age for casino gaming in the UK is set at 18, however, this is not the minimum age for all forms of gaming in the region. As discussed above patrons as young as 16 and even younger can enjoy limited forms of gaming. Nonetheless, these younger players cannot enter a 18 plus casino in the United Kingdom unless they are eighteen years old or they will face being guilty of a criminal offense. Are 18 And Up Online Casinos Legal In The UK? Yes they are, as long as they hold the proper licensing credentials, compliance certifications and are approved by the UK Gambling Commission. Who Regulates Gaming In The UK? All gaming activities, which are not betting, in the U.K. are managed and regulated by the UK Gambling Commission. This regulatory body was established through the 2005 Gambling Act. The regulatory body’s responsibility includes ensuring compliance, consumer protection, and enforcing the proper licensing for commercial 18 and over casinos and the National Lottery. Betting is regulated by the Financial Conduct Authority, which works to vet betting shops and brokers for proper and legitimate business ethics. Underage gaming is a serious crime and if found guilty can carry a criminal offense. In the United Kingdom offenders who receive their conviction can earn jail time and/or lose their driver’s license, ability to work with children, the right to vote while imprisoned, and if a non-citizen their ability to continue to live in the U.K.
Where Can I Find 18 and Up Casinos In the United Kingdom? There are several big-name eighteen plus casinos with populate several town and regions. All casino gambling in the United Kingdom requires players to be at least 18. Above we mentioned several large popular casinos, however, to provide more information we will list smaller UK casinos which allow 18-year-olds to wager below. These districts have the ability to launch and license smaller casinos: Bath and North East Somerset District Council, East Lindsey District Council, Luton Borough Council, Scarborough Borough Council, Swansea City and County Council, Torbay Borough Council, Wigtown Divisional Licensing Board in the area of Dumfries and Galloway Council, and the Wolverhampton City Council. Licensed online casinos are also another option for legally sanctioned gambling action for players 18 and up in the UK. The brands you see listed on this page have been vetted for legitimacy, quality, fair gaming practices, and effective security protocols. What Gambling Offers Are Illegal In United Kingdom? Any gaming providers whether online or offline not licensed by either the UKGC or a smaller local district are considered wholly illegal. In this case, the Gambling Commission maintains the right to take action against the operator, where payments from or to the site may be suspended, withdrawn, or completely shut off. In this case, the agency’s focus is on punishing operators, not players.